A systematic review may take up to 12 months or more to complete. This can vary depending upon the number of databases you search, how many items are retrieved, the number of people you work with on the review, your experience with the systematic review process, etc. MCW librarians can help you with your search and save you time. Please contact us with any questions about systematic reviews. To request a systematic review, please request a reference consultation. Step 1: Initiate the process, organize the review team, develop a process for gathering user and stakeholder input, formulate the research question, and implement procedures for minimizing the impact of bias and conflict of interests (see standards in Chapter 2). 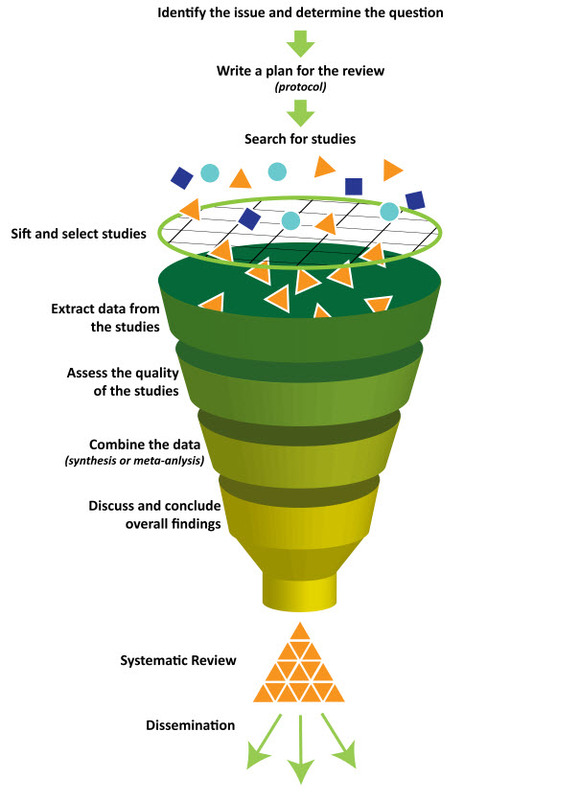 Step 2: Develop the review protocol, including the context and rationale for the review and the specific procedures for the search strategy, data collection and extraction, qualitative synthesis and quantitative data synthesis (if a meta-analysis is done), reporting, and peer review (see standards in Chapter 2). Step 3: Systematically locate, screen, and select the studies for review (see standards in Chapter 3). Step 4: Appraise the risk of bias in the individual studies and extract the data for analysis (see standards in Chapter 3). Step 5: Synthesize the findings and assess the overall quality of the body of evidence (see standards in Chapter 4). Step 6: Prepare a final report and have the report undergo peer review (see standards in Chapter 5). Adapted under Creative Commons Attribution-NonCommercial-NoDerivs 3.0 Unported License. from: Cochrane Infographics.